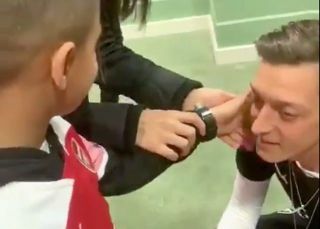 Mesut Ozil had Arsenal fans praising his class on Friday as he shared a video of a meeting with a young fan who sadly lost his eyesight due to a rare disease. It hasn’t been straight-forward for the 30-year-old on the pitch this season as he has struggled to cement his place in Unai Emery’s starting line-up. However, he was given the nod against Napoli in the first leg of their Europa League quarter-final tie at the Emirates on Thursday night, helping the Gunners to a 2-0 win. After the game, he seemingly made this young fan’s night as Ozil met ‘Mikey’, who lost his eyesight due a rare disease. It’s really not that often you see footballers make gestures like this, especially those at the top level, or perhaps some of them do so without posting on social media. Nevertheless, what matters is that Ozil has arguably inspired this young lad to continue to play football with his caption below, and gave him a memorable moment to meet his hero. Well played, Mesut. You’re an amazing man Mesut. A herö! ??? for a reason ?????? Wonderful Mesut . What an amazing little boy ?? RESPECT, you have a beautiful heart ?? Class, love you Mesut ? ?